The Chicago Cubs head to Petco Park on Wednesday to take on the San Diego Padres. The probable pitchers are Kyle Hendricks for the Cubs and Paul Clemens for the Padres. The opening line for this game has Chicago at -225 and San Diego at +207. The over/under is 8.5. The Cubs have a 57-61-6 over/under mark and a 67-57-0 run line record, meaning they cover 54% of the time. The Padres are 74-51-0 against the run line and have a 65-58-2 over/under record. They cover the spread 59% of the time. The Cubs head into this game with a 79-45 record, and they are 34-26 on the road. Starting pitcher Kyle Hendricks has a 11-7 record with an ERA of 2.16 and a WHIP of 1.00. He has 127 strikeouts during his 146 innings pitched and he has given up 110 hits so far this year. He has surrendered 6.8 hits per 9 innings and he has a FIP of 3.45. The bullpen this season has an earned run average of 3.60 and they have allowed 288 base hits on the year. Teams are hitting .215 against the pen while they've been struck out 377 times and walked 152 times this year. As a unit, Chicago has given up 6.99 base hits per nine innings while striking out 8.81 hitters per nine. They are 1st in the Majors in team earned run average at 3.10. The Cubs pitchers have collectively given up 871 base hits and 390 earned runs. They have allowed 128 home runs this season and they allow 1.1 homers per nine innings as a staff. Chicago as a pitching staff has walked 382 batters and struck out 1,096. They walk 3.1 men per 9 innings while striking out 8.8 per 9. They have a team WHIP of 1.12 and their FIP as a unit is 3.82. As a team, Chicago is hitting .258, good for 13th in the league while putting together a .267 average on the road. The Cubs have a .434 team slugging percentage and an OBP of .347 which is good for 2nd in the league. They rank 15th in baseball with 8.79 hits per contest. Kris Bryant comes into this game hitting .299 and his on-base percentage is at .390. He has 141 hits this season along with 100 runs scored and 84 runs batted in. He's struck out 123 times and has walked 57 times. Anthony Rizzo is hitting .301 and he has an on-base percentage of .399. He has totaled 136 hits so far while scoring 76 runs and he's driven in 87. He has walked 62 times and has struck out 83 times. The Cubs have 1,090 hits, including 227 doubles and 158 home runs. They've stolen 52 bases while they've been thrown out stealing 29 times. Chicago has walked 506 times this season and they've struck out 1,033 times as a unit. They've left 929 men on base and have a team OPS of .780. They score 5.13 runs per contest and have scored a total of 636 runs so far this year. San Diego comes into this game with a 30-32 home mark and a 53-72 overall record. With an ERA of 4.82, Paul Clemens has a 2-2 record and a 1.58 WHIP. He has 27 strikeouts over the 37.1 innings he's pitched during which he has given up 39 hits. He has allowed 9.4 hits per nine innings and his FIP stands at 6.95. So far this season the bullpen has an earned run average of 4.42 and they have given up 400 base hits on the year. Teams are hitting .242 against the Padres bullpen while being struck out 408 times and walking 181 times this season. As a team, San Diego has allowed 8.89 hits per nine innings while striking out 7.87 batters per nine. They are 22nd in the league in team earned run average at 4.52. The Padres pitchers as a team have surrendered 1,101 base knocks and 560 earned runs so far this season. They have given up 145 home runs this year and they give up 1.2 home runs per nine innings as a staff. San Diego as a staff has walked 452 hitters and struck out 975. They give up a walk 3.6 times per 9 innings while they strike out 7.9 per 9. Their team WHIP is 1.39 while their FIP as a staff is 4.43. As a team, they are batting .238, good for 30th in the league while putting together a .246 average at home. The Padres hold a .397 team slugging percentage and an on-base percentage of .302 which is good for 29th in baseball. They rank 29th in baseball with 8.04 hits per contest. 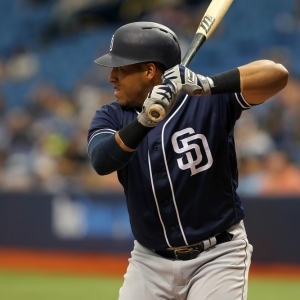 Yangervis Solarte comes into this matchup batting .285 and he has an OBP of .351. He has 84 hits this year along with 44 runs scored and 52 RBI. He's struck out 45 times and has walked on 26 occasions. Wil Myers is hitting .267 and he has an OBP of .344. He has collected 124 hits so far while he's scored 80 runs and drove in 71. He has earned a walk 55 times and has punched out 124 times. The Padres as a unit have 1,005 base hits, including 205 doubles and 145 homers. They have 105 stolen bases while they've been thrown out 34 times. San Diego as a team has walked 356 times this year and they have struck out 1,154 times. They've had 751 men left on base and have an OPS of .700. They score 4.36 runs per game and have totaled 545 runs so far this season.